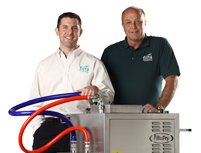 What is the Filta Eco Award? program in place and has been certified by a FiltaFry technician. the “Filta Eco-Award” Sticker at the entry door or window of the dining establishment using the FiltaFry service. This sticker represents to the customers that these establishments have taken extra care for the kitchen cleanliness while working to become eco-sustainable.